Moisture–cured polyurethane will take at least 7 days to cure completely. However, after 2 days you may walk on the floor in socks or stockings. You may find that, for a short time, you will leave footprints where you walk and every speck of dust will cling. Don’t worry—once the floor completely dries this won’t happen anymore. Your floor should be vacuumed or swept frequently and washed with hot water and methylated spirits 10:1. A mild detergent, such as dish washing liquid, can be used occasionally, but regular use will leave a film on the surface. We recommend the use of a commercial cleaner which can be purchased off us direct. Please contact us should you wish to purchase this cork/wood floor care cleaner. 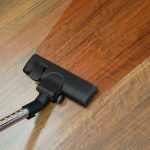 We do not recommend the use of steam mops to clean your solid wood, engineered timber or cork floor. Like everything, polyurethane floor glazing will wear. Heavy traffic areas will of course wear faster than low traffic areas. Floors left dirty and gritty will wear faster than those kept clean. Re-glazes may be carried out anywhere from 3 to 5 years apart, depending on the circumstances. During a re-glaze, your floor will be lightly sanded, washed with a special solvent and have 2 coats of polyurethane floor glazing applied. It is important to note that a re-glaze will not remove any deep scratches or imperfections. Ask about our re-glaze programme for optimum results and maintaining perfection.